christmas gifts, with Love NB…. There’s always that one person that’s hard to buy for. You know…..the one that has everything!! What do you buy them for Christmas??? Look no further…we have the perfect Christmas gift idea for you! 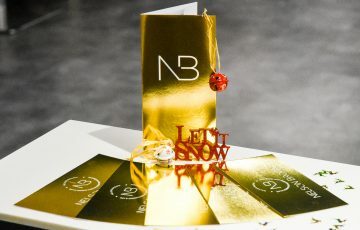 Why not gift them an NB studio gift voucher? Beautifully presented in a gorgeous gold wallet. You can even choose whether you would like it to be for hair, beauty or laser services! The vouchers come in multiples of £10 to infinity! Last date for posting these golden beauties will be Friday 21st December. Treat the one you love to this, sealed with a loving kiss. At Christmas time it will unfold, our vouchers are made of gold!! !